This is a very handy little tool. 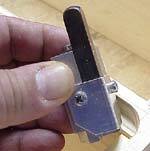 This is a very nice little tool that I saw Norm Abram (New Yankee Workshop) use. I actually bought one before having a real use for it just because it seemed to be such a nifty idea; and Norm had one. Now I use it all the time, and it IS a very good idea. All this little corner chisel does is square up the corners of rabbets, dados and mortises that have been made with a router that leaves rounded corners. Set the guides built into the corner chisel into the corner of your mortise; give it several raps with a hammer and clean out the waste with a chisel. Instantly you have a clean 90-degree corner. On larger radius corners, I occasionally have to finish cleaning one side of each corner up with a small conventional chisel but that is quick and easy. This is one of those tools that is by no means a necessity for completing a project, but no self respecting tool fan will be without one.